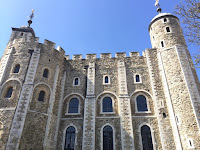 I’ve been so busy these last few weeks since we returned from our London trip, I never got around to posting about our fabulous visit to London Tower on our last day. My excuses include gearing up for a new release (HAUNTED SOULS is out in 7 days! Electronic formats are up forPreorder – do you have your copy ordered?) and participating in a multi-author book signing weekend (all day Friday, Saturday, and Sunday from 11 – 8!) at the Artist Shanties at Hyannis Harbor. But I did want to share pictures and facts about London Tower, since I learned so much! 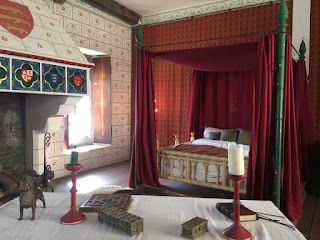 It was especially interesting to me since I was in the middle of reading a fantastic trilogy on The Wars of the Roses by Conn Iggulden, so seeing the actual places where some of the events happened was surreal. 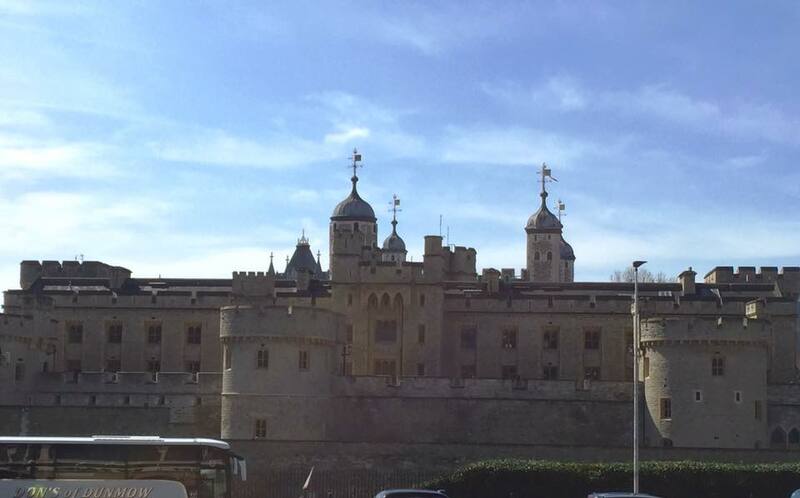 We arrived at Tower of London via the Tower Hill tube station right in time for a tour by one of the Beefeaters (the nickname of The Yeoman Warders of Her Majesty's Royal Palace and Fortress the Tower of London), which was very informative and entertaining. After that, we did some exploring on our own, even leaving for a while to have lunch at Borough Market and returning for more. I’ve included photos of some of the highlights, although there is too much to see to record it all! Boleyn and other royals were executed. A monument sits on the paved area on the green where Anne Boleyn was executed. Executions inside the Tower walls, away from the public spectators, were reserved for royalty and nobility found guilty of crimes. Another of Henry VIII's wives and Lady Jane Grey were also executed here by decapitation. 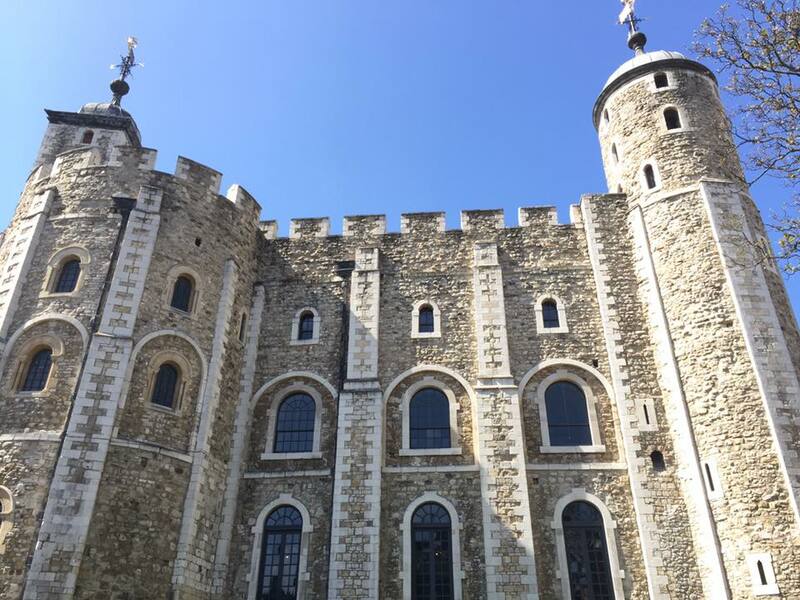 Nearby, the White Tower still stands, originally built by William the Conqueror in the late 11th century. Inside, there are four floors to explore...the Royal Armouries collection includes incredible displays of arms and armor. 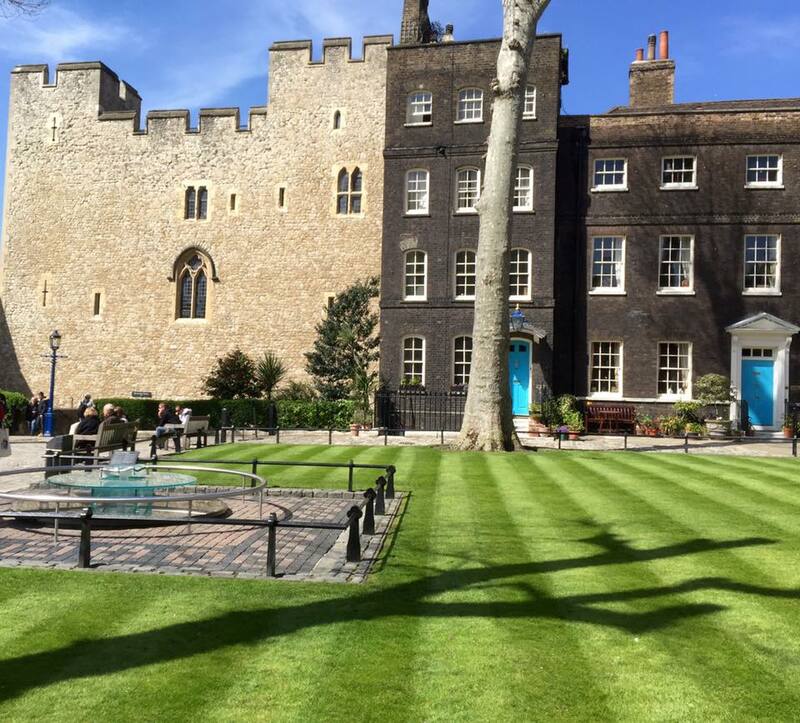 On the top floor you'll find a block and axe believed to be the one used in 1747 for the last public beheading, up on Tower Hill outside the fortress. The Tower ravens are kept here as well, in the area known as the Mews, although some were wandering the grounds. Legends say six ravens must be on the grounds at all times or the Tower and the entire Kingdom will fall. They keep two extra just to be safe. 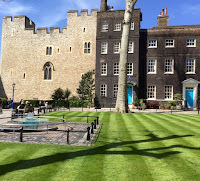 We were also able to view the Crown Jewels, but no pictures are allowed of that display. Needless to say, it’s a truly amazing sight. We saw the actual room where the young princes (and heirs to the crown) were held captive by Richard III. They disappeared, and their fate is a mystery, but Richard III was then crowned King. Also recreated was a replica of the medieval chamber of Edward I. Wakefield Tower, 13th century. We also saw the spot where Henry VI was killed. He was imprisoned in the Tower during the Wars of the Roses. It was another long but incredible day! 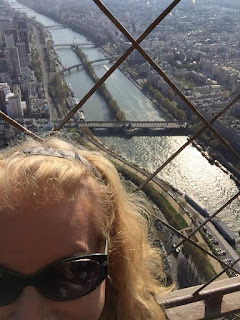 Our others adventures are chronicled in my posts Stonehenge and Soccer, The Churchill War Rooms and London Eye, and The Catacombs of Paris and Eiffel Tower. 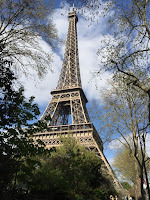 There’s so much to see and of course we didn’t manage it all, but I think we made the most of our five days there! the blue one will be ours! I have a busy weekend lined up! I’ll be signing books all weekend at the Hyannis Artist Shanties at Hyannis Harbor with two other Cape Cod authors, Katie O’Sullivan and K.R. Conway. 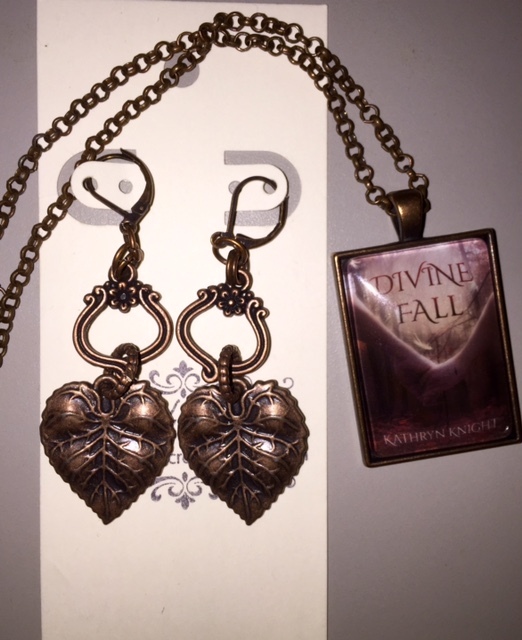 Between the three of us, we have a dozen titles for adults and teens, in genres including romance, paranormal suspense, urban fantasy, and young adult. 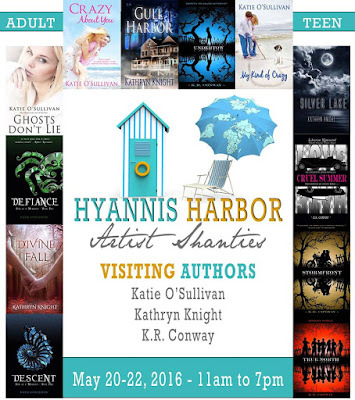 So if you’re in the Cape Cod area, stop by to grab some new summer reads! We’ll be there in the Barnstable Shanty from 11 am – 7 pm on Friday, May 20, Saturday May 21, and Sunday, May 22. 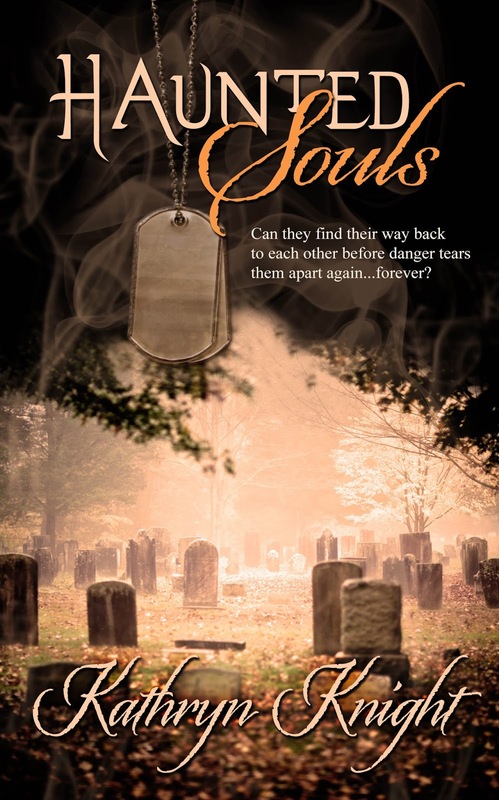 Unfortunately, my upcoming release HAUNTED SOULS, a military romance/ghost mystery set in Barnstable Village, will not be available yet, but you can pre-order on Kindle or Nook to have it automatically download on June 1, the official release date. 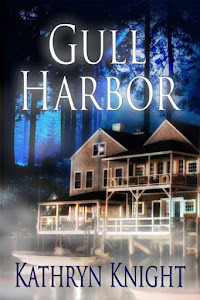 GULL HARBOR, a #1 Amazon Bestseller, will be available in print copies, and this is also a steamy romance + spooky ghost story set on Cape. Between the three authors, we’ll have a number of novels with local settings, so if you’re just visiting, you can take a piece of Cape Cod home with you. season fall, & fallen angels. The Artist Shanties are a group of cute little stand-alone “studios” right along the water, and offerings vary by weekend, and all items available are handmade or handcrafted by the artist. The site has a link to all the artists and their work, along with the dates they’ll be there. I visited last weekend and ended up buying some beautiful earrings from the jewelry artists in the Shanty we’ll be in this weekend. 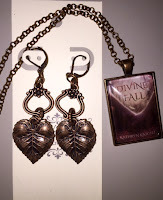 They go perfectly with my DIVINE FALL book cover pendant, which is one of my favorite necklaces. So we’re keeping our fingers crossed for gorgeous weather and lots of visitors, as spring seems to have finally arrived here. Find us in the light blue Barnstable Shanty on Ocean Street, across from The Black Cat restaurant, and pick out your next great read! It's almost here! 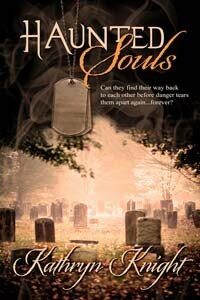 HAUNTED SOULS, my fourth novel, releases on June 1 from The Wild Rose Press! 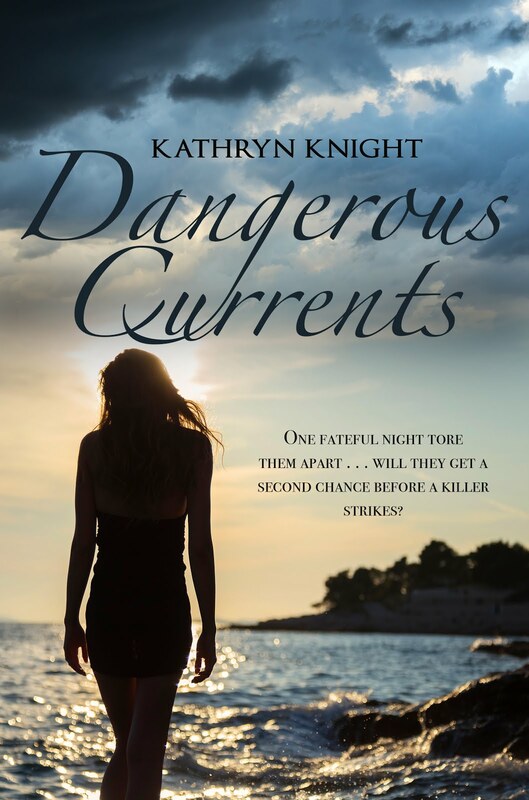 Pre-order this steamy military romance/ghost mystery now on Kindle to have it download automatically on June 1st, just in time for beach weather (fingers crossed - it's been a chilly spring here on Cape Cod). Four years ago, Emily Shea and Staff Sergeant Brett Leeds agreed to part with no strings attached. Sparks flew during their brief affair, but fate intervened, sending Brett overseas. When an unexpected pregnancy derailed Emily’s own plans, her attempts to locate Brett were soon overwhelmed by the challenges of single motherhood. Now, Brett has returned home, and Emily is forced to share her secret. Despite feeling betrayed, Brett is determined to forge a relationship with their son, Tyler. As the former lovers battle both their inner demons and their mutual desire, another presence enters their lives—Tyler’s imaginary friend. Soon, however, the chilling evidence points to a different conclusion: a ghost has formed a dangerous connection with their son. 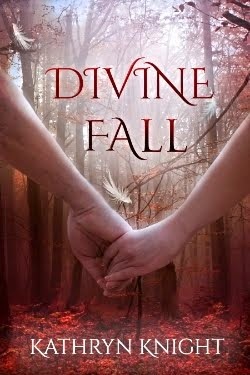 Emily’s attempts to help both a lost soul and a friend in need spiral toward a deadly confrontation, and Brett must race to save Emily before he loses her again—forever. I'll be celebrating the new release at the Facebook Event on Thursday, June 9th - consider yourself invited! I'll be hosting a number of guest authors who'll be visiting with readers and giving away prizes - gift cards, free books, jewelry and other swag. All you need to attend is an internet connection! Join here and save the date: HAUNTED SOULS RELEASE PARTY. Thanks for sharing in my excitement! 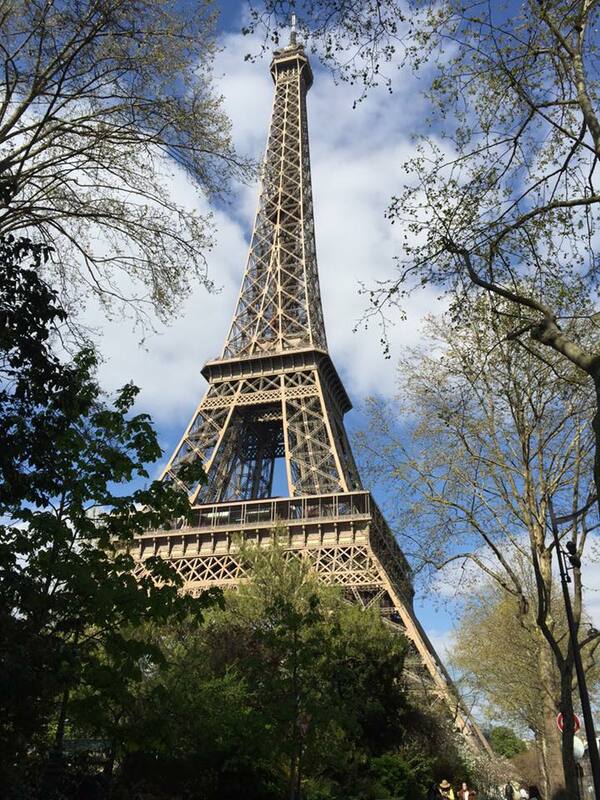 On our fourth day in London, we took an early train to Paris. Although we would only have one day there, it was definitely a memorable one! 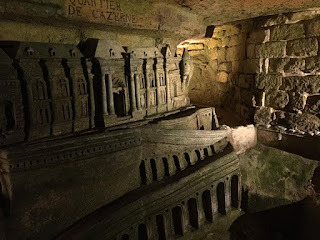 We tried to make sure we had something for everyone in the family on this trip, and the one thing I insisted on, as an author of ghost stories and a fan of haunted places, was to visit the Catacombs of Paris. 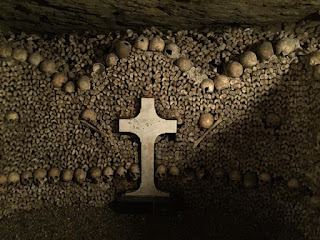 I first learned of these ossuary tunnels when I did a blog post on graveyards for a Halloween blog hop, and I found the story of the Catacombs both eerie and fascinating. Apparently I’m not the only one, as the line to get in was very, very long. But I had booked a guided tour in advance, so after lunch we met our guide outside the entrance. The way down is via a very narrow spiral staircase that leads 64 feet below the ground. 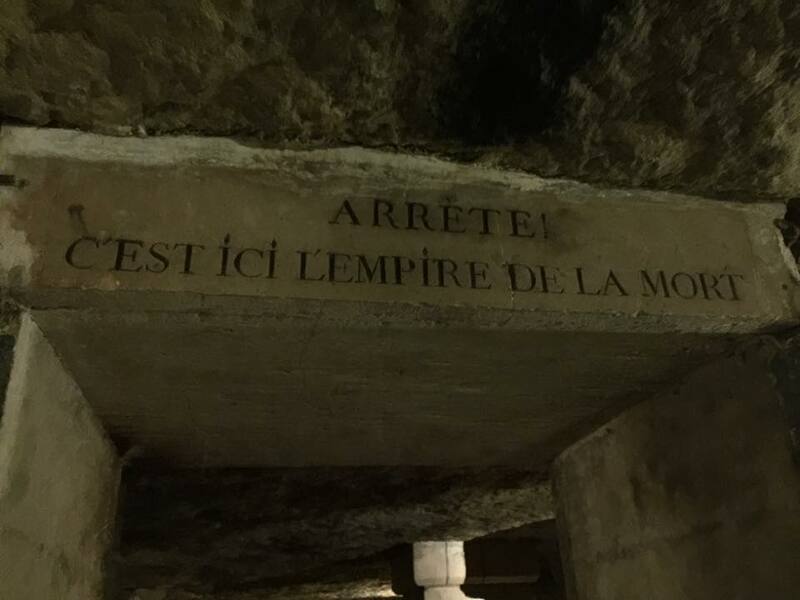 We were treated to some of the initial history of the network of 187 miles of tunnels beneath the city: how they were created initially to excavate lime, how the city was built from what was mined, and how eventually, in the 1700s, Paris was in danger of sinking into the earth due to the collapsing tunnels. Workers were sent down to reinforce the mines. During this time, a quarry inspector named Decur carved this Palace in Minorca from his memory of being held captive in a fort across from it. He did this (and other carvings) from 1777-1782 and eventually died down there in a cave-in. "Stop! This is the land of the dead." 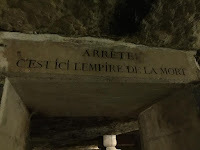 ossuary areas in the Catacombs. Around this time, Paris was experiencing another crisis—the overcrowding of cemeteries was endangering public health. Bodies were literally overflowing, disease was spreading, and there was no room for new burials. Moving the bones became a priority, and there was plenty of room in the newly repaired tunnels. Over six million bodies were moved, the product of 1,000 years of burials (often in mass graves) in Paris. This effort took two years. It’s difficult to describe the sheer volume of bones down there…it goes on and on and on through the tunnels, and while some walls are displayed artistically, the bones stretch back from there in deep piles. Obviously it was impossible to keep bodies together or add much in the way of identification, but sometimes headstones were brought down to add to the designs, and there are a few signs indicating which cemetery the remains are from. A monument added to the design. After two hours down there (and one medical emergency involving a member of our group—especially scary down in the dark, surrounded by bones, with no emergency exits or even normal staircases…it took medics a long time to get to us), we climbed another spiral staircase and emerged above ground. Even since, my mind has been spinning with ideas for a new story! I came up with the idea for my upcoming release HAUNTED SOULS after a ghost tour in historic Barnstable Village, so we’ll see if the Catacombs can inspire a new plotline! A quick snack and then we went in the other direction, up above the city, the entire 921 feet to the top of the Eiffel Tower. We had a gorgeous day and beautiful views. It wasn’t long before we had to make our way back to the train station and head back to London, but we had more adventures to look forward to. London Tower is coming up in the next post, and if you want to see Days 1 and 2 (Soccer and Stonehenge) or Day 3 (London Eye, London Dungeon, and Churchill War Rooms), I’ve linked those posts in this paragraph as well (colored titles). 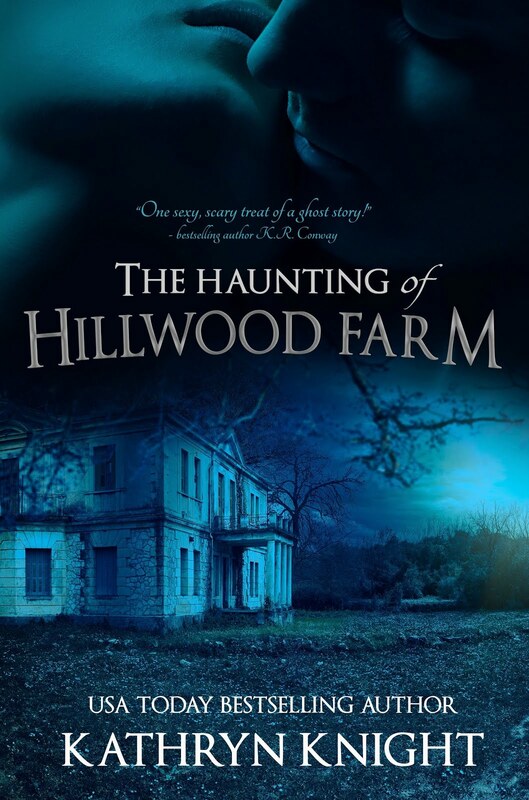 Thanks for stopping by, and check out my books for some spooky ghost stories mixed with steamy romance! 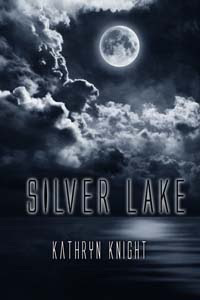 HAUNTED SOULS releases June 1, 2016, but it’s available for Pre-Order on Kindle and Nook, and both SILVER LAKE and GULL HARBOR are currently available in the meantime. And if you want to see some more pictures of the Catacombs, visit my Pinterest board!